ACT.4 - 「因縁のリベンジバトル」"Revenge Battle of Fate"
ACT.6 - 「啓介の意地(プライド)」"Keisuke's Determination (Pride)"
ACT.7 - 「無（ゼロ）の心」"Mind of Nothing (Zero)"
ACT.11 - 「終止符。そして……」"Full Stop. 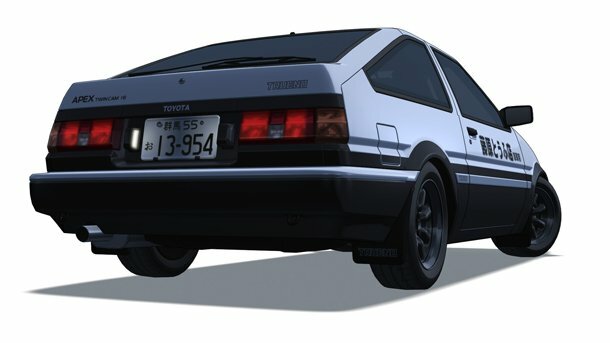 Continued..."
ACT.14 - 「決着！極限ヒルクライム」"Conclusion! 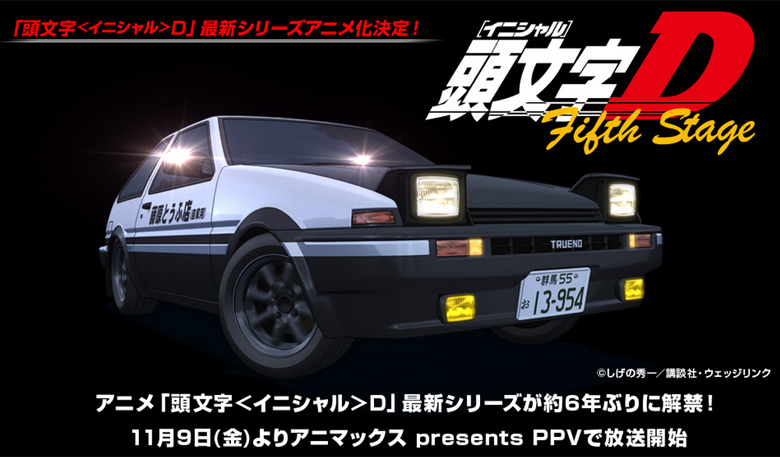 Extreme Hill Climb"
Initial D Fifth Stage was officially confirmed on August 6th, 2012 by Perfect Choice TV. Animax has decided to air episode 1 of Fifth Stage on Sunday, 8:00pm November 4th, 2012 (UTC+09:00) as a preview. The official air date for Fifth Stage Episode 1 - 2 is confirmed to be on Friday 4:00am November 9th, 2012 (UTC+09:00) (second Friday of the month). And there will be two new episodes every month. The theme song "Raise Up" will be by M.O.V.E as usual. The episodes will be aired on Animax's PPV program for 840 Yen each viewing (two episodes). The DVDs will be released some time after at the same time as the broadcast ends. 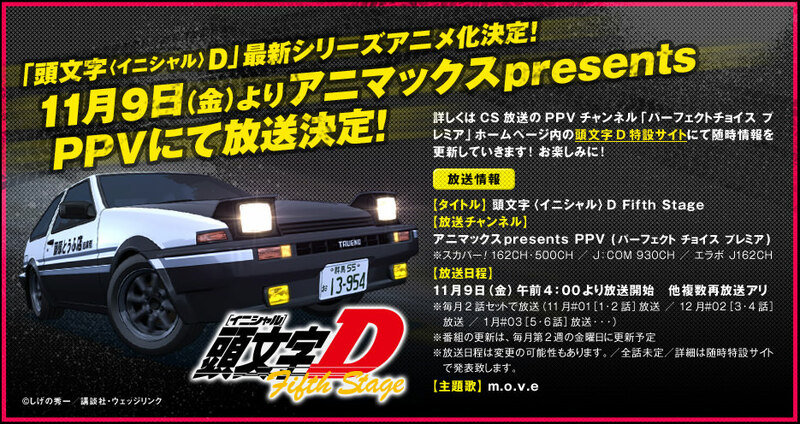 Animax's own promo for Initial D Fifth Stage!! Image size reduced, original size: 935 x 496. Click here to view the image in its original dimension. Image size reduced, original size: 780 x 457. Click here to view the image in its original dimension. 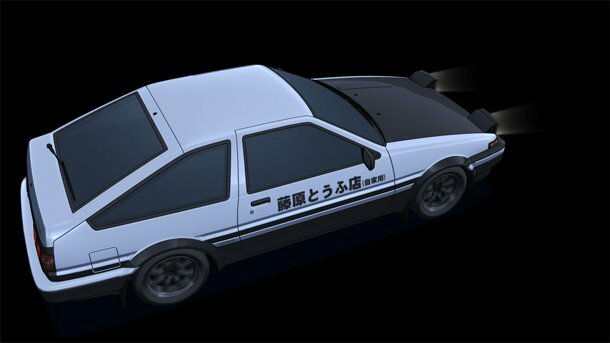 It has been announced in this year's 35th issue of Young Jump magazine that Shuuichi Shigeno's racing manga Initial D will get a new anime adaptation. So far no additional details have been revealed as of writing. More information are yet to be revealed in the combined 36th and 37th issue of Young Jump magazine on August 6th. Stay tuned! Easily the biggest news since the acquisition of the franchise by Funimation! I can't wait for more details! I hope it can get picked up here. The fact that the series went straight to Funi's budget line wasn't a good sign, but I know I'd love to see it licensed because it's pretty much the last leg of the series. Crossing my fingers. Also, August 6 is Eight-six day. That just blew my mind. Didn't even think that the date was significant! Image size reduced, original size: 960 x 711. Click here to view the image in its original dimension. That's my exact reaction when that realization hits me. This is indeed the real deal!! The best thing that came out in this forum in like forever! ^ My face when ever I see something I want. This is no exception. SHUT UP AND TAKE MY WALLET! *looks in wallet realizes there's no money in it* Crap... you guys can sell the wallet for money. I'm hoping its Fifth Stage. Goddamn, Slade's back too?! Not even 24 hours since the announcement and already old members are returning. This is just as impressive as expected. If whatever they announce is going to touch on Fifth Stage's story, it better be an anime series and not a movie. I'd hate to see the story get condensed. Seeing what they did with Persona 4 over at AIC/Aniplex made me think that's a likely situation. I'm so happy that I almost don't believe in this news! 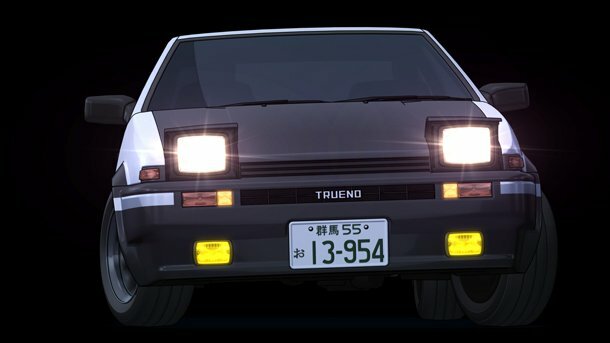 If Fifth Stage were to become a movie then at least it will look good. I'm really hoping for a series though so the plot doesn't get smushed into an hour and a half. My real hope is that FUNimation acquires the rights to translate and release it here in the states. That's right, I liked the FUNimation dub. Hopefully it won't be as bad as Fourth Stage. I say bad because Fourth Stage felt so rushed. If 5th Stage was even a movie it should be a 3 or 4 part movie or something like that. 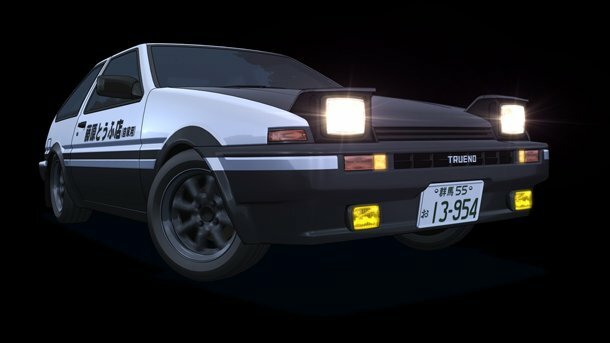 At least all the people I got into fans of Initial D won't have to ask me when the next series will be animated anymore. much datas in the next double issue YM #36-37 next week. Very good news! Looking forward to hearing more details and crossing my fingers that it actually is 5th Stage granted any new adaption would be welcome. If whatever they announce is going to touch on Fifth Stage's story, it better be an anime series and not a movie. I'd hate to see the story get condensed.I do hope Funimation get its too cuz I like theyre dub as well. I hope its 5th Stage and yes not a movie either.Also hope Funimation gets the rights as well,cuz I like theyre dub as well. It will probably be another PPV series like Fourth Stage, although I hope it's a high-budget TV series. There's easily enough material to make a two-season series now. I mean, it's only been EIGHT YEARS lol. Aagh, that's the second time I've read this today. Fourth Stage ended in 2006. That's six years. Still a long time though. I thought it was 04, for some reason.